From M A Comley, NY Times and USA Today bestselling author, with over two million copies sold worldwide. She's forced to go back to the drawing board and sift through dozens of files to uncover the answers. Did the original investigation team miss the clues intentionally? Will a surprising piece of evidence she discovers solve the ten-year-old cold case? Grab this thriller today if you enjoy a page-turning read. Ideal for fans of Shalini Boland and Angela Marsons. From M A Comley NY Times bestselling author of the Justice series. This is one of my favourite books by this author so far. Sally is a fantastic character, as are the others. Not only do I love the stories in the series i'm also finding myself looking forward to finding out what's happening in Sally's personal life, her mum, dad, Simon and her lovely dog, Dex. I love to have that personal attachment in a series. Great book. I absolutely adore DI Sally Parker & her author, MA Comley. Jam-packed with suspense, every book is better than the previous one. This is a series that every mystery/suspense/thriller fan will adore! This definitely is a must read!! An extremely well developed plot, great characters and didn't see it coming ending. A long time fan of the Justice series, when the first Sally Parker novel was released, I knew Lorne now had some serious competition. I loved Sally Parker, her team, her family and everything about the books. Cold Case has quickly moved to the top of my list of favorite reads for 2017. Anyone connected to police work or law enforcement, or even the judicial system knows how difficult it is to go back and reconstruct a case after years have passed. Witnesses have forgotten things. Perhaps evidence has disappeared. And even more distressing, you have to step on the toes of the original investigators sometimes, which creates a tension not only in the case, but with your fellow workers and officers. Handed a ten year old murder case of a fellow officer's wife, with a limited time to solve it, Sally and her team are faced with all the above and more. A fabulous read, that truly reads like true crime and an excellent police procedural. Well developed characters with a complex plot, and "didn't see it coming" ending. Highly recommended. I devoured this book! M.A. Comley knows her craft and I throughly enjoyed the cold case element to this story. The suspects are mounting and I was certainly outwitted, not guessing the culprit until the moment the author revealed it. I love that in a book, because I'm always trying to be one step ahead of the cases in police procedurals. Another element I enjoyed was the personal side of DI Sally Parker. 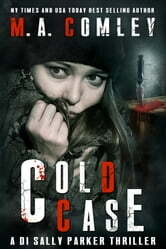 I am a huge fan of this author's Justice series, but I think Cold Case may have tipped the edge in my favourite stakes. I'm excited to read where Sally Parker goes next. Highly recommend this to fans of police procedural books, you won't be disappointed. This was a good little read. The ending was quite a surprise, I never saw it coming.